A year of Mod Aus Bee blocks. I finally made the last months blocks for the Mod Aus Bee. It has been 12 months since we started and I have enjoyed making the chosen blocks each month. I am especially getting good at the AMH feathers and have been inspired to make my own one day. Please excuse the photos. They were all taken at night on my iPhone. There are 2 more to go to finish the bee round. Thank you Mod Aus Bee hive for the wonderful experience. I will always have my beautiful Refractatorium quilt as a memento of this group. 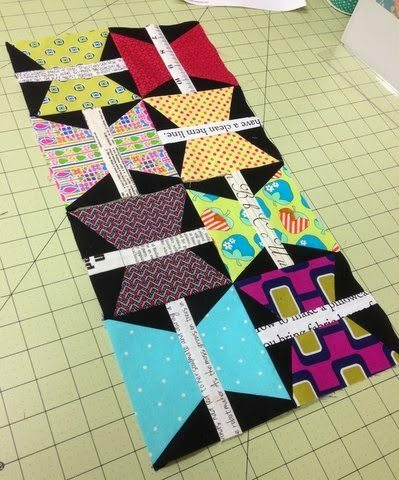 All very clever blocks … Great effort ..
Lovely blocks – this has been such a wonderful bee to be a part of! What a great group! All those blocks are wonderful. 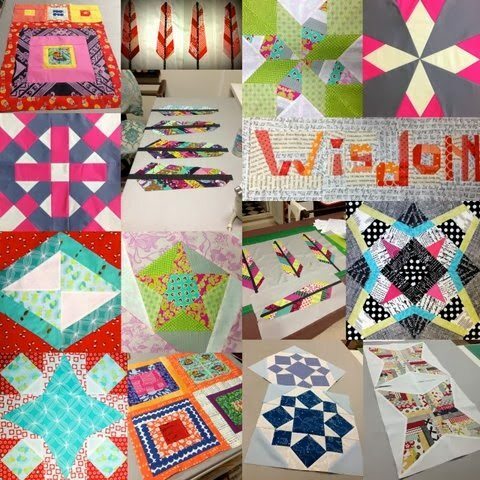 Your Refractatorium quilt is such a super star quilt!! Ummmm, these are still two people to go. Jess @ the elven garden and Jeanette! The blocks you have made are all wonderful!